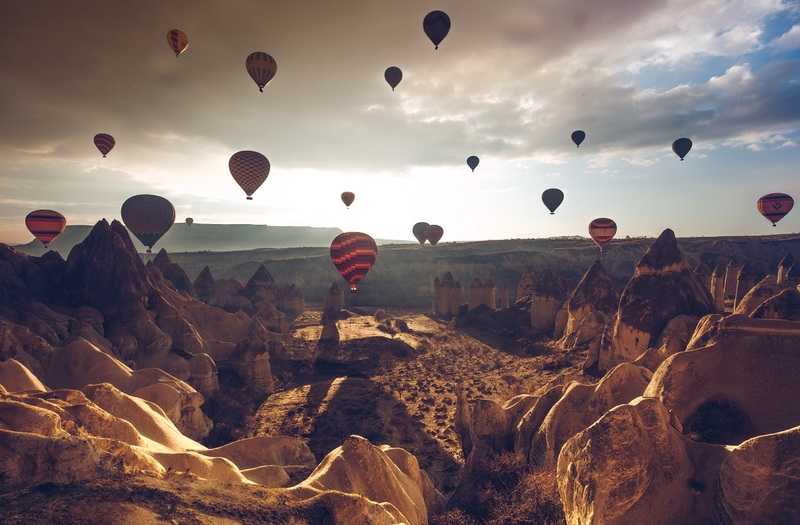 It doesn’t really matter whether you are a frugal traveler or you enjoy splurging on trips – everyone has their little guilty pleasure on the road. 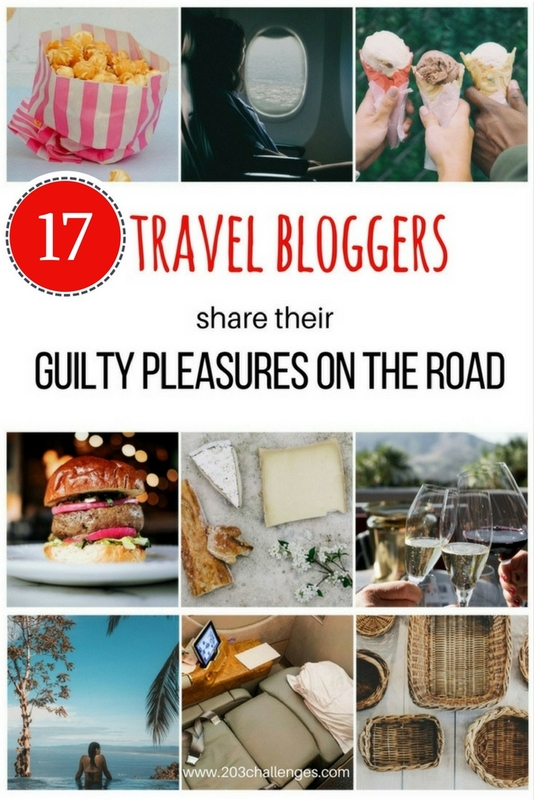 I asked a few travel bloggers to share their favorite guilty pleasure, and their answers are incredibly varied. Can you recognize yourself in some of them? When I am traveling, especially long-term, I cannot help but go to the movies. Going to a movie theater abroad is significantly cheaper than the $12-15 USD price tag back home. I have seen films in Malaysia, Hong Kong, Colombia, and Singapore, just to name a few! I admit that I like to travel in comfort. So for me, my secret guilty pleasure is wearing lots of layers on an airplane, but NO BRA. Am I right, ladies?! It’s complete freedom and much more relaxing, especially for those long-haul flights. Plus, no one can tell! My biggest traveler guilty pleasure is getting a private pool villa when I can because I loooooove the privacy and freedom that you get with it. Bit of a splurge, but so worth it! I’ve longed to travel in First Class on an Emirates A380 for the longest time. Fitting such an extravagance into my meager budget was impossible until I remembered that Emirates is a partner airline of Qantas and I could use my frequent flyer points to book a flight for nix! Quicker than you could say ‘shower in the sky’, I blew a truckload of points booking a short flight across the Tasman (SYD – AKL). The flight was everything that I imagined and more. It is the one time in my life that I hoped for delays (and was rewarded!) so that I could spend as much time in my private suite (yes, suite, not seat!) as possible. First class passengers enjoy two huge fully equipped bathrooms complete with showers, exceptional chef-prepared meals, top-shelf booze and exemplary service. I only wish I could fly like this every time! Mine would be shopping! Everywhere I go, I leave room in my suitcase to bring home something special from my destination. Whether it’s a necklace from Hong Kong, a basket from South Africa, or new jeans from New York City, my house is filled with treasures from trips around the world! Whenever and wherever I travel, I always look for local, artisan cheese. As a former cheese-maker, I revel in all the creativity and deliciousness that appears in the form of cheese. Throughout the United States, no matter where you go, it’s possible to find unique cheese-makers fulfilling their passions, and my belly. Anybody who knows me knows that champagne is my favorite drink. So, of course, I am always on the lookout for a special place to enjoy some bubbles. My favorite locations to do that are rooftop bars. I mean, I love rooftop bars for their views already, but if you throw a glass of champagne into the mix, you just made this girl really happy! And although I developed my love affair with champagne in Europe (particularly in Brussels, where I lived for 11 years), the first bars that come to mind are mostly in Asia. Asia has some of the highest and most amazing rooftop bars in the world, with unparalleled views. One of my favorite is Vue Bar at Hyatt on the Bund Hotel in Shanghai. The view, overlooking both sides of the Huangpu River, is simply breathtaking. The bar is situated on two floors and it is also a great place for brunch or for just enjoying the sun on the rooftop sunbeds. But probably the most unusual place where I had a glass of champagne so far was in the fields of Bagan, in Myanmar… for breakfast, just after the most amazing hot air balloon flight! Being a long-term traveler this may sound strange… but I sometimes crave time to myself. Some days the constant interaction, constant moving gets too much for me. This is when I retreat and on a Friday night I may be in bed by 9 pm, stone cold sober. This happens for a week when my mind knows I have had enough and it’s time to live in my head a little. After a few days my turtle mind will crawl back out of its shell. I like trying different desserts, especially local desserts in a specific country. That’s because food is one of the best representations of one’s culture. Plus, a dessert completes every meal! My guilty travel pleasure is definitely Vietnamese food. I just cannot resist trying Vietnamese food wherever I go, since I’m Vietnamese and I miss my country badly when I travel. On one trip, I even had Vietnamese food so often that I ate a local dish only one or two times. My biggest guilty pleasure when traveling is looking for the most popular local ice cream shop. Since I have such a big sweet tooth, I love hearing recommendations and trying original ice cream everywhere I go! One of my most recent samples: Little Man Ice Cream in Denver. I can’t count just how many miles we may have traveled over the years to see our favourite artists and bands unknown. It’s led to adventures as diverse as visiting Tammy Wynette’s trailer (all gilded and crystal) to the gig-fest that was our dream roadtrip from Nashville to Clarksdale and Memphis. But perhaps the crowning moment was stepping out late one night in Ghent, Belgium to find a tribute to one of my favourite artists: Iggy Pop. In person-sized letters, propped idly against a historic wall, Ghent was inviting us to Search and Destroy. Don’t get me wrong, I’m the most shameless tightass you’ll ever encounter on the road. Of course I will eat from dumpsters. Indeed I will hitchhike, even if it’s -43°C and snowing outside. And yes, now that you mention it I DO in fact own a pair of boxer shorts that I found hanging off a road sign in Serbia. But show me a good café latte in a country that traditionally serves mud in a cup and I will invite you to TAKE ALL MY MONEY. No matter how desperate I get, I can never quite silence the Melbourne coffee wanker in me, which is why I will always enjoy that double shot skinny soy orange mocha latte, even when I’m covered in dirt and dressed in a potato sack. Mine is bread! I love trying new types of bread around the world. I probably carb load too much but it makes me so happy! I am so guilty of making travel days so much easier with using airport lounges. Airport lounges completely make layovers so much better with free wifi, free food, free booze, and sometimes even free showers. Thankfully my credit card offers free airport lounge access in more than 950 airports around the world. No matter if you are off on a honeymoon in Aruba or a weekend getaway it gets the trip started off on the right foot. So, what’s your travel guilty pleasure? Such a fun read! Thank you for including me.